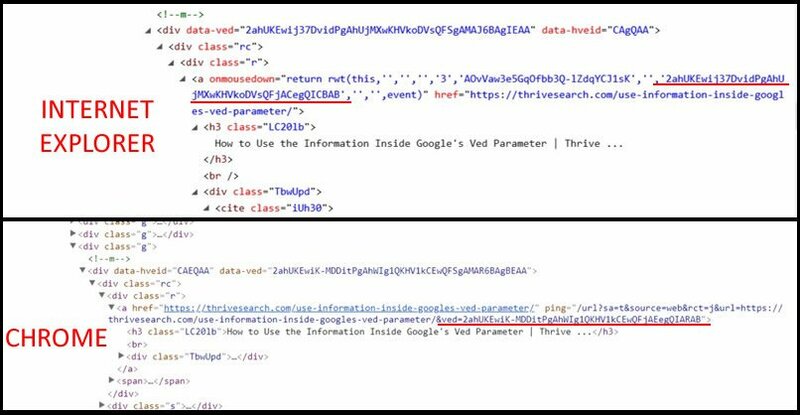 Eagle eye Dave Davies spotted that Google has moved the ved parameter that has been in the source code of the Google search results since at least 2013 from the href link section of the code. It is unclear why Google moved it but Google does change things often, so I am not sure we can speculate why it was changed. What is the ved parameter? Kevin Jones explained When you click on any of the links in Google’s search results, the URL (address) of the link contains a “ved” parameter. This “ved” code contains information about the link that you clicked on, so Google can get a better picture of how you use their site. When a user comes to your website (through Google’s search results), the ved code is (usually) also passed to you - in the referer HTTP header. By decoding it, you can get extra insights into how visitors come to your site. Oh, I doubt webmasters have anything to do with that. Internal parameters & similar things change from time to time; they're not meant for external use. Think of it how you might change things in your site's backend.